Congratulations to those who put together this year’s Hamtramck Labor Day festival. 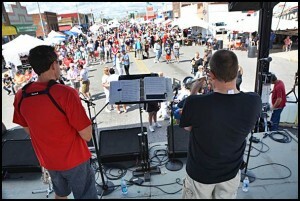 It was another successful weekend, and the festival made Hamtramck shine. We know how to throw a great party. Not to take away from the hard work of the volunteers who put this festival together, but now is a good time to revisit what to do with the event. At one time this was considered an official city event. We think there is a good argument to turn this back to the city’s control, just to give it stability and guaranteed financial backing. We think it’s too much to ask volunteers to be held responsible for covering the costs of the festival. The festival is a terrific promotional tool for the city. It needs a professional event organizer to work on this year-round. Asking volunteers to throw themselves into organizing this event is too much to ask. But again, what a great job these volunteers did. It’s time for the city to take ownership of the festival and begin marketing it to compete with Oakland County’s Arts, Beats & Eats that also takes place every Labor Day weekend. The Hamtramck Festival has already shown that its musical line-up is far superior to the Beats & Eats’ lame offering. And while we’re thinking out loud here, is there any reason why we couldn’t have occasional weekend block parties during warm weather? Hamtramck needs to promote itself as a hip hangout and place to live. We need to attract young adults and make this an exciting and fun place to live. It could be the needed nudge to bring back retail development on Jos. Campau. It sure beats allowing another religious institution or non-profit from gobbling up Jos. Campau retail space. But that’s another issue for another day.